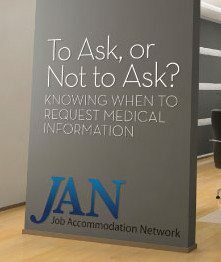 JAN Consultants respond to a variety of inquiries from employers about the ADA rules related to asking for medical information in response to receiving an accommodation request. Sometimes employers are uneasy about making medical inquiries and requesting medical documentation. The ADA does not require employers to request medical information after receiving a request for accommodation. However, in some situations, employers feel compelled to request medical information because sometimes the disability and need for accommodation are not known or obvious. As part of the process of determining if an individual is eligible to receive accommodations, an employer has the right to know if that person has a substantially limiting medical impairment. Requesting medical information is one way to learn this. What is known about the individual’s medical impairment? When the impairment is obvious, medical documentation may not be necessary. For example, if an employee who uses a wheelchair requests that his desk be raised as an accommodation, the impairment and need for accommodation are obvious. Medical documentation about the impairment will not be necessary, but information regarding the appropriate desk height will be. The individual with the disability may be able to provide the information that is needed in order to implement the accommodation. Tip: When the impairment and need for accommodation are known or obvious, consider focusing on gathering detailed information about the accommodation, rather than requesting unnecessary medical information. When the impairment is not obvious, employers may request documentation that verifies the existence of an impairment (e.g., learning disability, seizure disorder, mental health impairment, back injury, etc. 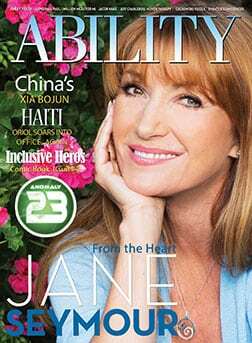 ), that the impairment affects a major life activity (e.g., reading, concentrating, interacting with others, lifting, etc. ), and is substantially limiting in some way. For example, if an employee shares that she is having difficulty meeting the employer’s attendance policy because of the side-effects of medication but has never disclosed a disability before, it may be necessary to gather information about the individual’s medical impairment and limitations, how her ability to meet the attendance policy is affected, and what accommodation is needed. Tip: When the impairment and need for accommodation are not known or obvious, begin by asking the individual for more detailed information about his/her medical impairment. If the employee cannot provide the necessary information, then medical documentation can be useful. Using the example above, it may be useful to ask what side-effects the employee is experiencing, how the medication affects her ability to get to work on time, and what type of accommodation is suggested? Under the ADA, in response to an accommodation request, an employer may ask what impairment is involved, why medication is needed, and its impact on job performance. An individual may be asked to obtain a letter from his or her healthcare provider (or to complete ADA paperwork) that verifies the existence of an impairment, includes details regarding the individual’s limitations, and explains why accommodation is needed at this time. What is known about the individual’s limitations and how the limitations affect performance of job duties, or ability to meet performance/conduct standards? In order to effectively process an accommodation request, it is important to have at least a basic understanding of how limitations impact the performance of job functions (or ability to meet standards). For example, if an employee discloses that she has a back injury, has a lifting restriction, and needs light duty, then more information will be needed in order to proceed in the accommodation process. What is the lifting restriction (e.g., 10 lbs., 20 lbs.)? What specific job duties are impacted? What is meant by “light duty”? There is no universal definition of “light duty” and so the healthcare provider should explain what “light duty” means with respect to the individual and his or her ability to perform job duties. Is the lifting restriction temporary or permanent? Is the need for light duty temporary or permanent? In this type of situation, medical information may be needed to verify the existence of the back impairment and to gain a better understanding of the individual’s specific restrictions as recommended by the healthcare provider. Tip: When medical information is requested, ask specific job-related medical questions about the individual’s limitations and ability to perform job duties. Simply sending the employee to a healthcare provider with a job description is not likely to yield the most useful information. By addressing the specific work-related limitations, sufficient information will more likely be obtained early-on in the process. What is known about the need for accommodation? If the need for accommodation is apparent, talk to the individual about his or her specific needs. Discuss the type of accommodation (e.g., schedule modification, intermittent leave, work from home, work-related equipment, etc.) and how the individual believes the accommodation will enable him or her to perform job duties, or meet performance/conduct standards. If the need for accommodation is understood, the type of accommodation is clear, and a change can easily be implemented, then medical documentation regarding the need for accommodation may not be necessary. If the need for accommodation is not apparent, confirmation may be requested from the healthcare provider that a change is needed at work due to a medical impairment. For example, if an employee requests a space heater because she has rheumatoid arthritis that is exacerbated by below average indoor temperatures at work, the employer may seek confirmation from the healthcare provider that the accommodation is needed due to her medical impairment. Employers may ask what limitations are causing work-related issues and what, if any, suggestions the healthcare provider has for accommodation. Healthcare providers may not always know what accommodations will benefit the individual, or may not have time to provide detailed information. JAN Consultants can help employers, individuals with disabilities, healthcare providers, and others, identify accommodation solutions. Tip: If an employee with a disability requests a modification or equipment at work that employees without disabilities are provided as a benefit of employment, the employee with a disability should not be asked to provide medical information to receive the same benefit simply because it is requested due to a medical impairment. Employers make modifications for employees for many reasons (e.g., schedule change, work from home, ergonomic equipment, etc.). Employees with disabilities should not be held to a different standard to receive the same benefits or privileges as employees who have not disclosed a disability. Knowing when to request medical information can be tricky. Remember, the ADA does not require employers to request medical information. Before asking, consider the impact the information will (or will not) have on effectively processing an accommodation request. The individual who requested the accommodation is often a good source of information about the disability and accommodations. If the individual cannot provide the necessary information, then medical documentation can be useful. The key is to only ask for information that is needed to process the accommodation request.